The new website for Ateah Realty in Victoria Beach Manitoba just went online. 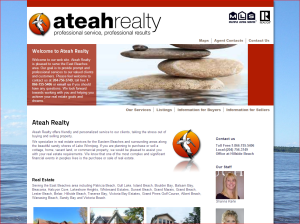 Ateah Realty had an old website developed in Joomla that we re-designed and implemented in Typo3 6.1. This site is the first to use our new Typo3 real-estate plugin developed in extbase and fluid. It uses an eye-catching layout in red and white with an adaptive background image. The plugin has many features such as different listing layouts, a detail view, integrated Google Maps. It also includes the possibility to have multiple agents and to associate a listing with a real estate agent. Each detail view then contains a contact form so interested parties can directly contact the responsible agent for more information concerning the displayed listing.